A rare white humpback whale was spotted off the coast of Gisborne. Expert Ingrid Visser says it is likely Migaloo, a white humpback known to frequent Australian waters. Whitley and his crew were “completely buzzing” at the “once in a lifetime” sighting. “When we left, we thought it was Migaloo, he was right underneath the stern, it was crazy. Visser said just from the footage it was difficult to identify the whale which was probably Migaloo. However, there was a possibility it was the first documented sighting of the third recorded white humpback whale. The second recorded white humpback is located in the Atlantic Ocean and Visser was 99 per cent sure it would not be that whale. It was also possible the whale was the offspring of Migaloo, she said. The whale in the video was either albino or leucistic, meaning white pigmentation. The difference between the two was albino animals have pink eyes while leucistic animals have black eyes. “If it was, then it would show he was on a different migration pattern, then it’s a real biggy. In the next week, the whales would continue north which, if spotted again, could provide another opportunity to identify the animal. However, Visser stressed observers should follow the law and give the animals more than 50m of space and travel no faster than 5 knots when near them. Both Migaloo and the white humpback from the Atlantic have identifying features on their tails. “The Atlantic whale has black on the underside of the tail whereas Migaloo is all white. Migaloo also has a distinctive dorsal fin, she said. It was “a very exciting find” for Visser who had gained an interest in white marine mammals after publishing a report of all the black dolphins and whales around New Zealand in 2004. 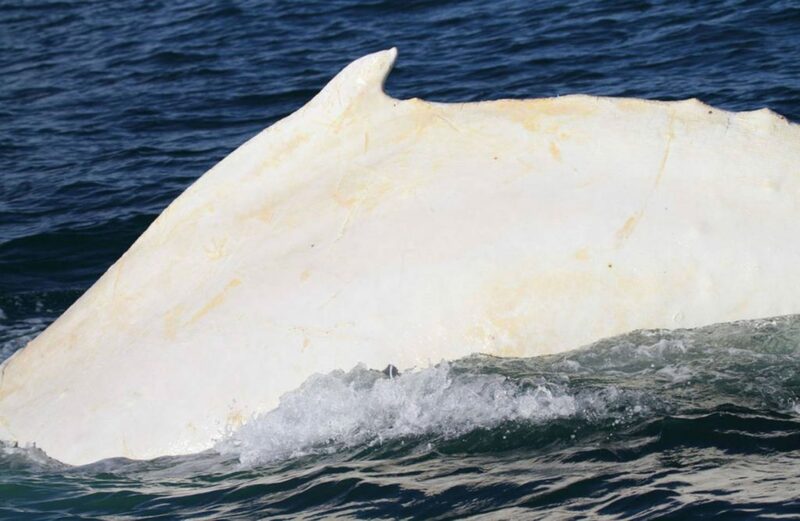 A white whale, later confirmed to be Migaloo, was spotted in the Cook Strait in 2015. DNA analysis by Oregon State University in the United States confirmed that a skin sample taken from the white whale matched the genetic profile taken from Migaloo off Australia, confirming it is the same whale. Anyone who sights the latest white whale is asked to report it to the Orca Research Trust on 0800 733 6722. * Do not disturb, harass or make loud noises near marine mammals. * Contact should stop if marine mammals show any signs of becoming disturbed or alarmed. * Do not feed or throw any rubbish near marine mammals. * Avoid sudden or repeated changes in speed or direction of any vessel or aircraft near a marine mammal. *There should be no more than three vessels and/or aircraft within 300m of any marine mammal. * Ensure that you travel no faster than idle or “no wake” speed within 300m of any marine mammal. * Approach whales and dolphins from behind and to the side. * Do not circle them, obstruct their path or cut through any group. * Keep at least 50m from whales (or 200m from any whale mother and calf or calves). * Swimming with whales is not permitted. ← White Chipmunks in Worcester, Mass.